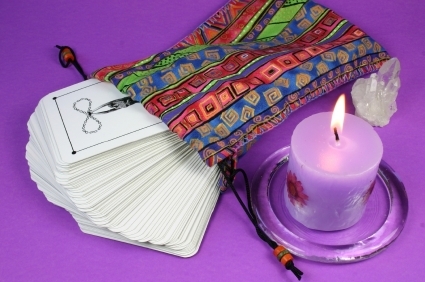 Whether you are new to the Tarot or have been using this ancient tool for years, it is wise to define exactly what you hope to accomplish in your relationship with the Tarot. You can do this by composing a mission statement. Like a life mission statement, your Tarot mission statement establishes a framework for how you want to utilize the many gifts offered by the 78 archetypes. Writing a mission statement is a way of working “backwards” with your Tarot deck – beginning with the end result (what you hope to accomplish with your deck and your readings) and building your skills and activities toward that end. Once you have a clear understanding of your “destination,” you can better assess where you are now, what steps are suitable for the end result, and whether your current efforts are moving you in the hoped-for direction. One way to begin defining your Tarot Mission Statement is to pose these questions to yourself: What is my intent for the use of this deck? How can I best serve others with my Tarot deck? These are not simple questions, so one way to begin the process of answering them may be to do some thoughtful journaling about your relationship with the Tarot. You can also pull cards from the deck, asking specifically for help with this question (see spread below). The questions you could ask your Tarot deck might be, “What is the wisdom of the Tarot with regard to my mission with this tool?” or “What is the Tarot’s guidance about my purpose with itself?” In the latter question, we areactually asking the deck itself for guidance as to how we can best use it. Mission statements are as different as the people who craft them. Some common mission statements include goals such as the desire to develop, or enhance, intuition or self-understanding; to “think outside the box;” to change one’s self-image; or even to speak and write creatively. A mission statement may also include a reference to one’s spiritual ideal and one’s desire to communicate with spiritual forces. However you develop it, the most important aspect of your mission statement is that it is an honest and sincere assessment of the relationship you aspire to create and maintain with your Tarot deck. Once you have clearly formulated your mission, I urge you to honor your accomplishment by blessing or “consecrating” the deck. Usually this would be whichever deck you will be using most often. But you can do the blessing on a favorite Tarot deck, a new Tarot deck, or even your I-can’t-seem-to-get-it Tarot deck. Spirit to assist those who use your deck in choosing the cards that are right for them. You may wish to add a short blessing, prayer or mantra that focuses on your spiritual ideal, such as love, peace, God -- whatever captures the higher spiritual presence for you. You may ask this spiritual ideal to come forth and swathe the deck in light, or any higher vibration. 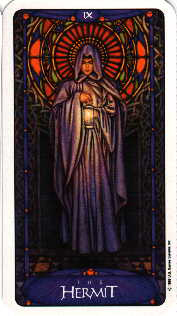 You could even use the Hermit card to help you visualize the elevated frequency that you are seeking. Re-order the cards in chronological order (both Major and Minor). Keep them in order for a day or two. Swirl a smudge stick, or a stick of incense, around your deck, allowing the smoke to both purify the deck and call upon Spirit to infuse the deck its power. Dab some oil of lavender around your deck or sprinkle it with water (lightly so as not to damage the deck). Place a clear crystal on top of the deck for a day or so. Sprinkle your deck with salt. Rap the deck against a table or other hard surface or fling it across the floor (to shake off any negative energies). Place your deck under your pillow at night to clear its energy. Use your own sacred objects on or nearby the deck. In an extreme case -- that is, when you feel your deck has been psychically damaged in some way -- you can wrap it, put it in a leak-proof container and bury it in the earth for a few days, thereby allowing the earth to absorb any of the deck’s negative energy. Similarly, you can use the natural healing powers of sunlight or moonlight to clear your deck, always being sure to protect your deck from the elements. No one of these methods is superior – chose ones that appeal to you and set your intention that this method will remove any negative or unwanted energies. Above all else, when clearing and blessing your deck, think of the deck as your connection to Spirit and that which is sacred. Treat it with respect and reverence. To review, the steps we’ve discussed so far for blessing your deck are as follows: Define and write out your Tarot mission statement. Then clear your deck using one or more of the methods described above. Once your deck is “clean,” hold your hands around the deck and speak your mission aloud, saying “I consecrate this deck as my tool for_________________ (see sample blessings below). The ideal would be to do this kind of blessing in a group, with a supportive friend or friends, to witness your mission statement and where you could also witness theirs. In my experience, developing a Tarot mission statement can be very empowering. For example, you may feel spiritually uplifted and connected. Also, many people find that their relationship with their Tarot deck is dramatically altered once they have created and articulated this framework for its use. Some Tarot users find a surprising shift in energy, power, sensitivity and perceptivity after defining the deck's mission. So be forewarned! Don't attempt a deck consecration unless you are ready for a more elevated interaction with your deck. A note of caution: Remember that the power does not emanate from the Tarot deck. Power comes from Spirit working inside of you and through you. The deck in and of itself, has no intrinsic value or worth. It is, after all, simply paper or cardboard. So use the ideas mentioned in this article only if they feel right to you. Tarot is a uniquely individual and spiritual tool, so again, remember that the most powerful and beneficial Tarot deck blessings, clearing techniques and mission statements are the ones you create. Trust in Spirit, and in yourself. The results may surprise you. If you are having problems defining your Tarot Mission Statement, try the spread below to help you articulate your purpose. Begin by simply holding your deck in both your hands. Breathe slowly and carefully, knowing that Spirit enters through the breath. As you hold the deck, ask your guides and angels to assist you in determining the answers that you seek in this spread. Shuffle, breathe, surround the cards with light. Focus on the question: “What is the Tarot’s guidance about my purpose with itself?” It helps to write the question out on a piece of paper. Fan the cards out before you. Focus on each question as you choose. Lay the cards in the positions indicated, face down. Turn them over one at a time, contemplate their meaning. 1. What personal strength can help me in my use of the Tarot? 2. What areas in my life are still being developed that would be best not to include in my mission statement? Is there anything I should be concerned about or especially cautious about when doing a reading? 3. Help me understand what I hope to accomplish with the Tarot. Show me cards that can help me understand my intent for the use of my Tarot deck? 4. What is the universe’s intent for me when I use the Tarot? What does Spirit want me to know about how best to use these cards? Note: The ideal would be to get Major Arcana cards for these questions, but if you receive a Minor Arcana card here, don’t disregard it. The subtle messages of the Minor Arcana are important too. When posing powerful questions like these, it is important to create an environment in which you can be receptive to the answers. Be sure you have cleared your mind and focused your thoughts before engaging in this exercise. Only when we are truly in such a receptive and contemplative mode can the messages of the Tarot resonate with the deepest part of ourselves. I consecrate this deck to bring light wherever there is darkness. I consecrate this deck for guidance and wisdom for myself and others for the higher good for all concerned. I consecrate this deck to enlighten myself and others more fully. May all who use and touch this deck know the love of Spirit and be drawn into the Light of Spirit. I dedicate this deck to serve others with their spiritual growth, for wisdom, knowledge and to bring healing and peace to all who seek its wisdom. I dedicate this deck to the development of my intuition so that I may be a source of guidance to others. Spiritual Tarot by Signe E. Echols, Robert Mueller, and Sandra A. Thomson. Geraldine Amaral is the co-author of Tarot Celebrations: Honoring the Inner Voice and creator of “Tarot 1-2-3,” an instructional video. She fell in love with the Tarot about 30 years ago when she had her first reading and has been using, studying and writing about the Tarot ever since. She utilizes Jungian/archetypal psychology and Divine Metaphysics in her work and is a respected/gifted intuitive counselor and nationally-known teacher. She focuses her work on how to apply the Tarot's esoteric principles in pragmatic ways as well as for insights and personal transformation. Her classes provide a unique blend of spirituality, psychology, philosophy, humor, literature and personal empowerment methods. She can be reached at 703-671-7421 or geraldine@thespiritualtarot.com. Visit her website at www.thespiritualtarot.com.